Not to be confused with Castle of San Marcos (El Puerto de Santa María). 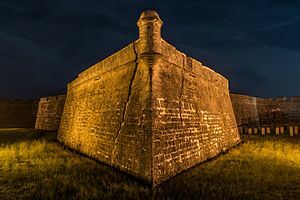 The Castillo de San Marcos is the oldest and largest masonry fort in the continental United States; it is located on the western shore of Matanzas Bay in the city of St. Augustine, Florida. The Castillo was designed by the Spanish engineer Ignacio Daza, with construction beginning in 1672, 107 years after the city's founding by Spanish Admiral and conquistador Pedro Menéndez de Avilés, when Florida was part of the Spanish Empire. 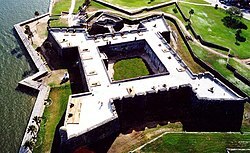 The fort's construction was ordered by Governor Francisco de la Guerra y de la Vega after a raid by the English privateer Robert Searles in 1668 that destroyed much of St. Augustine and damaged the existing wooden fort. 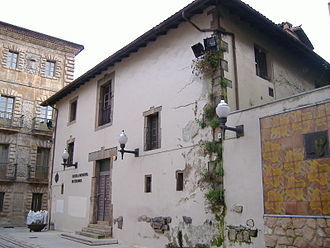 Work proceeded under the administration of Guerra's successor, Manuel de Cendoya in 1671, and the first coquina stones were laid in 1672. The construction of the core of the current fortress was completed in 1695, though it would undergo many alterations and renovations over the centuries. When Britain gained control of Florida in 1763 pursuant to the Treaty of Paris, St. Augustine became the capital of British East Florida, and the fort was renamed Fort St. Mark until the Peace of Paris (1783) when Florida was transferred back to Spain and the fort's original name restored. In 1819, Spain signed the Adams–Onís Treaty which ceded Florida to the United States in 1821; consequently the fort was designated a United States Army base and renamed Fort Marion, in honor of American Revolutionary War hero Francis Marion. The fort was declared a National Monument in 1924, and after 251 years of continuous military possession, was deactivated in 1933. The 20.48-acre (8.29 ha) site was subsequently turned over to the United States National Park Service. In 1942 the original name, Castillo de San Marcos, was restored by an Act of Congress. Castillo de San Marcos was attacked several times and twice besieged: first by English colonial forces led by Carolina Colony Governor James Moore in 1702, and then by English Georgia colonial Governor James Oglethorpe in 1740, but was never taken by force. However, possession of the fort has changed six times, all peaceful, among four different governments: Spain, 1695–1763 and 1783–1821, Kingdom of Great Britain, 1763–1783, and the United States of America), 1821–date (during 1861–1865, under control of the Confederate States of America). Under United States control the fort was used as a military prison to incarcerate members of Native American tribes starting with the Seminole—including the famous war chief, Osceola, in the Second Seminole War—and members of western tribes, including Geronimo's band of Chiricahua Apache. The Native American art form known as Ledger Art had its origins at the fort during the imprisonment of members of the Plains tribes such as Howling Wolf of the southern Cheyenne. 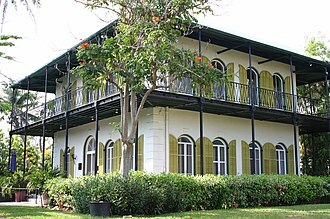 Ownership of the Castillo was transferred to the National Park Service in 1933, and it has been a popular tourist destination since then. The European city of St. Augustine was founded by the admiral Pedro Menéndez de Avilés for the Spanish Crown in 1565 on the site of a former Native American village called Seloy. The need for fortifications was recognized after it was attacked by Sir Francis Drake and his fleet of 22 ships in 1586, and over the next 80 years, a succession of nine wooden forts were built in various locations along the coastline. However, after a 1668 attack by the English pirate Robert Searle during which the town of St. Augustine was burned to the ground, wooden forts were deemed inadequate, and Mariana, Queen Regent of Spain, approved the construction of a masonry fortification to protect the city. The Castillo is a masonry star fort made of a stone called coquina (Spanish for "small shells"), which consists of ancient shells that have bonded together to form a sedimentary rock similar to limestone. Native Americans from Spain's nearby missions did most of the labor, with additional skilled workers brought in from Havana, Cuba. The coquina was quarried from the 'King's Quarry' on Anastasia Island in what is today Anastasia State Park across Matanzas Bay from the Castillo, and ferried across to the construction site. Construction began on October 2, 1672, and lasted twenty-three years, with completion in 1695. The barrels of cannons deployed on the terreplein project outward through multiple embrasures located along the curtain wall between San Pedro and San Agustín bastions. To the left of center is the sallyport—the only entrance to the fort, reached via drawbridge from the ravelin, which is located within the moat. The fort has four bastions named San Pedro, San Agustín, San Carlos and San Pablo with a ravelin protecting the sally port. On the two landward sides a large glacis was constructed which would force any attackers to advance upward toward the fort's cannon and allow the cannon shot to proceed downslope for greater efficiency in hitting multiple targets. Immediately surrounding the fort was a moat which was usually kept dry, but that could be flooded with seawater to a depth of about a foot in case of attack by land. Multiple embrasures were built into the curtain wall along the top of the fort as well as into the bastions for the deployment of a cannon of various calibers. Infantry embrasures were also built into the walls below the level of the terreplein for the deployment of muskets by the fort's defenders. It was through one of these embrasures that twenty Seminoles held as prisoners would escape in 1837. In 1670, Charles Town (modern-day Charleston, South Carolina) was founded by English colonists. As it was just two days' sail from St. Augustine, the English settlement and encroachment of English traders into Spanish territory spurred the Spanish in their construction of a fort. In 1702, English colonial forces under the command of Carolina Governor Governor James Moore embarked on an expedition to capture St. Augustine early in Queen Anne's War. The English laid siege to St. Augustine in November 1702. 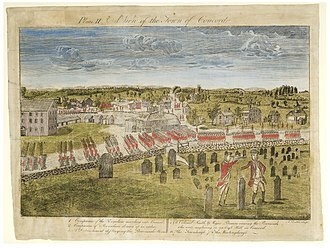 About 1,500 town residents and soldiers were crammed into the fort during the two-month siege. The small English cannon had little effect on the walls of the fort, because the coquina was very effective at absorbing the impact of the shells. The siege was broken when the Spanish fleet from Havana arrived, trapping some English vessels in the bay. 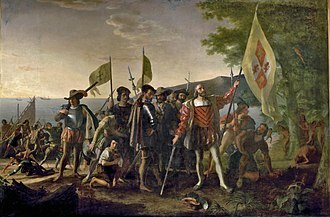 The English were defeated and decided to burn their ships to prevent them from falling under Spanish control, and then marched overland back to Carolina. The town of St. Augustine was destroyed, in part by the Spanish and in part by the English, as a result of the siege. Beginning in 1738, under the supervision of Spanish engineer Pedro Ruiz de Olano, the interior of the fort was redesigned and rebuilt. Interior rooms were made deeper, and vaulted ceilings replaced the original wooden ones. The vaulted ceilings allowed for better protection from bombardments and allowed for cannon to be placed along the gun deck, not just at the corner bastions. The new ceilings required the height of the exterior wall to be increased from 26 to 33 feet (10 m). 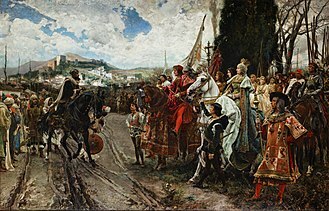 Spain and Britain were rivals in Europe, and since the two countries had both founded empires in the New World, their rivalry continued there as well. In 1733 a British vessel, the Rebecca, commanded by Captain Robert Jenkins, was seized in the Caribbean by the Spanish coast guard. Suspecting that the British had been trading illegally with Spanish colonies (which was forbidden by both Spain and Britain), the Spanish searched the ship. 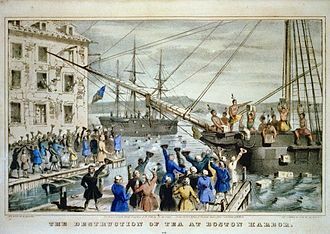 A fight broke out between the Spanish and British sailors. In the skirmish, Jenkins had his ear cut off by a Spanish officer, who picked it up and said "Take this to your king and tell him that if he were here I would serve him in the same manner!" When Jenkins reported the incident to British authorities, they used it as a pretext to declare war on Spain in 1739. The war was called the War of Jenkins' Ear. 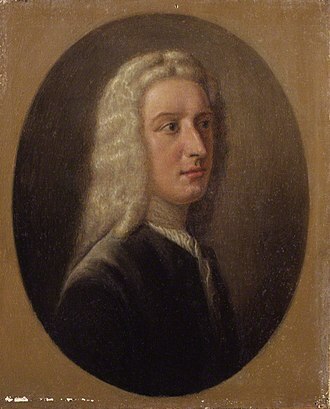 After British Admiral Edward Vernon won a huge victory at Portobelo, General James Oglethorpe, the founder of Georgia, was quick to imitate him in North America. In June 1740, Oglethorpe and an English fleet of seven ships appeared off St. Augustine. As in the 1702 siege, three hundred soldiers and 1,300 residents found refuge within the Castillo's walls. For 27 days the British bombarded the Castillo and St. Augustine. Realizing his cannon were not affecting the Castillo's walls, Oglethorpe decided to starve the people of St. Augustine by blockading the inlet at the Matanzas River and all roads into St. Augustine. However, some supplies were able to reach the city via the river, and with morale and supplies low for the English forces, Oglethorpe had to retreat. In order to protect the city from future blockades and sieges, the Spanish built Fort Matanzas to guard the river, which could be used as a rear entrance to avoid St. Augustine's primary defense system. In 1763, the British managed to take control of the Castillo but not by force. 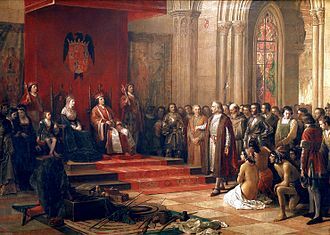 As a provision of the Treaty of Paris (1763) after the Seven Years' War, Britain gained all of Spanish Florida in exchange for returning Havana and Manila to Spain. On July 21, 1763, the Spanish governor turned the Castillo over to the British, who established St. Augustine as the capital of the province of East Florida, established by the Royal Proclamation of 1763. The British made some changes to the fort, and renamed it Fort St. Mark. As Great Britain was the dominant power in North America, they were not worried about keeping the fort in top condition. This attitude prevailed until the outbreak of the American Revolutionary War. The fort was used as a military prison during the war. Among those imprisoned was Christopher Gadsden, the Lieutenant governor of South Carolina. 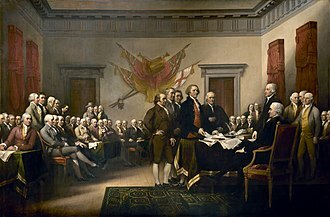 He was also a delegate to the Continental Congress and a brigadier general in the Continental Army during the war. He was released after 11 months. Improvements were begun on the fort, in keeping with its new role as a base of operations for the British in the South. The gates and walls were repaired, and second floors were added to several rooms to increase the housing capacity of the fort. 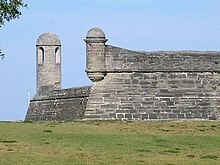 The Castillo saw action during the American Revolution mainly as a prison, although St. Augustine was targeted by several aborted expeditions from Georgia. Several revolutionary fighters who had been captured in Charleston were held there when it was taken by the British. The Spanish declared war on Britain in 1779, drawing off forces from Fort St. Mark and keeping the British occupied. Bernardo de Gálvez, governor of Spanish Louisiana, attacked several British-held cities in West Florida, capturing all of them. 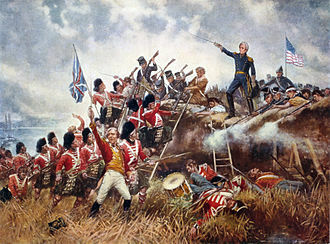 The only major British operation that used troops from St. Augustine was the poorly coordinated but successful capture of Savannah, Georgia; the city was taken by troops from New York before those from St. Augustine arrived. At the end of the war, the 1783 Treaty of Paris called for the return of Florida to Spain. On July 12, 1784, Spanish troops returned to St. Augustine. Reenactment of Spanish soldiers firing cannons. 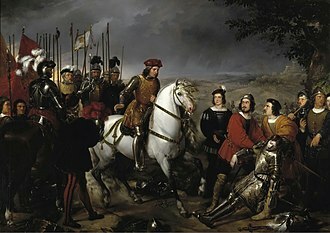 When Spain regained control over Florida they found a much-changed territory. Many Spaniards had left Florida after the hand over to Britain, and many British citizens stayed after it was returned to Spain. 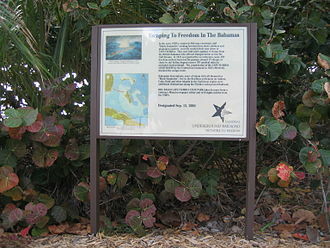 Many border problems arose between Spanish Florida and the new United States. Spain changed the name of the fort back to the Castillo de San Marcos, and continued to build upon the improvements that Britain had made to the fort in an effort to strengthen Spain's hold on the territory. 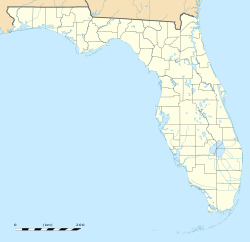 However, due to increased pressure from the United States and several other factors, in 1819 Spain signed the Adams–Onís Treaty, ceding Florida to the United States, which was transferred in 1821. Hotshot furnace used to heat cannonballs to shoot at wooden enemy ships. Upon receiving the fort from Spain, the Americans changed its name to Fort Marion. It was named to honor General Francis Marion, an American Revolutionary War hero nicknamed "The Swamp Fox." Structurally, the Americans made few changes to the fort during this time. Many storerooms were converted to prison cells on account of their heavy doors and barred windows. Also, part of the moat was filled in and transformed into an artillery battery as part of the American coastal defense system. The original Spanish seawall was dismantled to ground level and a new seawall constructed immediately adjacent to the seaward side of the original. At this time a hotshot furnace was also built in the filled-in section of the moat behind the newly built water battery. Cannonballs were heated in the furnace to fire at wooden enemy ships. In October 1837, during the Second Seminole War, Seminole chief Osceola was taken prisoner by the Americans while attending a peace conference near Fort Peyton under a flag of truce. 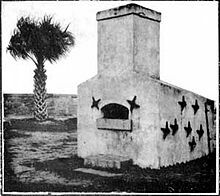 He was imprisoned in Fort Marion along with his followers, including Uchee Billy, King Philip and his son Coacoochee (Wild Cat), and then transported to Fort Moultrie on Sullivan's Island in Charleston's harbor. Uchee Billy was captured on September 10, 1837, and he died at the fort on November 29. His skull was kept as a curio by Dr. Frederick Weedon, who also decapitated Osceola after his death in Fort Moultrie and kept the head in preservative. On the night of November 19, 1837, Coacoochee and nineteen other Seminoles, including two women, escaped from Fort Marion. Coacoochee, known for fabricating entertaining stories, later told the tale that only he and his friend Talmus Hadjo had escaped by squeezing through the eight-inch (203 mm) opening of the embrasure located high in their cell and sliding down a makeshift rope into the dry moat. Talmus Hadjo, however, was not on the official list of prisoners. By whatever means the escape was actually effected, the escapees made their way to their band's encampment at the headwaters of the Tomoka River, about forty miles south of St. Augustine. Because of their ill treatment, they vowed to continue fighting, and the war was prolonged for four more years. The cell from which Coacoochee escaped was long part of the official lore of the fort. 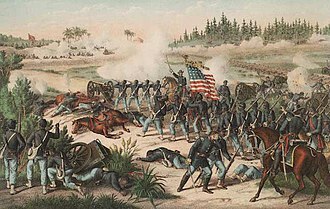 In January 1861, Florida seceded from the United States in the opening months of the American Civil War. Union troops had withdrawn from the fort, leaving only one man behind as caretaker. In January 1861, Florida troops marched on the fort. The Union soldier manning the fort refused to surrender it unless he was given a receipt for it from the Confederacy. He was given the receipt and the fort was taken by the Confederacy without a shot. Most of the artillery in the fort was sent to other forts, leaving only five cannons in the water battery to defend the fort. The Saint Augustine Blues, a militia unit formed in St Augustine were enrolled into the Confederate Army at Ft. Marion on August 5, 1861. They were assigned to the recently organized Third Florida Infantry as its Company B. More than a dozen former members of the St. Augustine Blues are buried in a row at the city's Tolomato Cemetery. The fort along with the rest of the city of St Augustine was reoccupied by Union troops after acting mayor Cristobal Bravo officially surrendered the city to Union Navy fleet commander C.R.P Rodgers on March 11, 1862. The Confederate forces left the city the previous evening in anticipation of the arrival of the Union fleet under the command of Commodore Dupont. National Park Service brochure showing an exploded view drawing of fort. The fort was taken back by Union forces on March 11, 1862, when the USS Wabash entered the bay, finding the city evacuated by Confederate troops. The city leaders were willing to surrender in order to preserve the town, and the city and the fort were retaken without firing a shot. Throughout the rest of the fort's operational history, it was used as a military prison. Beginning in 1875, numerous Native American prisoners were held at the fort in the aftermath of the Indian Wars in the west. Many would die at the fort. 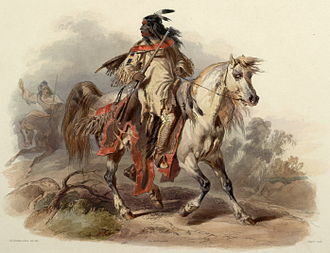 Among the captives were Chief White Horse of the Kiowa, and Chief Grey Beard of the southern Cheyenne. During this period, Richard Henry Pratt, a Civil War veteran, supervised the prisoners and upgraded the conditions for them. He removed the prisoners' shackles and allowed them out of the casemates where they had been confined He developed ways to give the men more autonomy and attempted to organize educational and cultural programs for them. They became a center of interest to northerners vacationing in St. Augustine, who included teachers and missionaries. Pratt recruited volunteers to teach the Indian prisoners English, the Christian religion, and elements of American culture. He and most US officials believed that such assimilation was needed for the Indians' survival in the changing society. The men were also encouraged to make art; they created hundreds of drawings. Some of the collection of Ledger Art by Fort Marion artists is held by the Smithsonian Institution. It may be viewed online. Encouraged by the men's progress in education, citizens raised funds to send nearly 20 of the prisoners to college after they were released from Ft. Marion. Seventeen men went to the Hampton Institute, a historically black college. Others were sponsored and educated in New York state at private colleges. Among the latter were David Pendleton Oakerhater, as he became known, who was sponsored by US Senator Pendleton and his wife. He studied and later was ordained as an Episcopal priest. He returned to the West to work as a missionary with Indian tribes. He was later recognized by the Episcopal Church as a saint. Pratt's experiences at Fort Marion became the basis for his campaign to create American Indian boarding schools. Although these schools were supposedly for the purpose of educating native people, they became sites where native children were prohibited from speaking their languages or practicing their own religion. Many children were removed from their families forcibly or under threat of withholding food rations. Children's letters home were censored, and many children were taken to agricultural labor camps over the summer, instead of being allowed to visit home. Many have accused American Indian boarding schools of countless abuses and violations of child labor laws, in addition to accusations of cultural genocide. Pratt's campaign began with the creation of the Carlisle Barracks, which was the first of over 450 American Indian boarding schools. From 1886–1887, approximately 491 Apaches were held prisoner at Fort Marion; many were of the Chiricahua and Warm Springs Apache bands from Arizona. There were 82 men and the rest were women and children. Among the men, 14, including Chatto, had previously been paid scouts for the US Army. Among the Chiricahua were members of the notable chief Geronimo's band, including his wife. Geronimo was sent to Fort Pickens, in violation of his agreed terms of surrender. While at the fort, many of the prisoners had to camp in tents, as there was not sufficient space for them. At least 24 Apaches died as prisoners and were buried in North Beach. In 1898, over 200 deserters from the Spanish–American War were imprisoned at the fort. This marked one of the last uses of the fort as an operational base. In 1900, the fort was taken off the active duty rolls after 205 years of service under five different flags. In 1924, the fort was designated a National Monument. In 1933 it was transferred to the National Park Service from the War Department. In 1942, in honor of its Spanish heritage, Congress authorized renaming the fort as Castillo de San Marcos. As an historic property of the National Park Service, the National Monument was listed on the National Register of Historic Places (NRHP) on October 15, 1966. The National Park Service manages the Castillo together with Fort Matanzas National Monument. In 1975, the Castillo was designated an Historic Civil Engineering Landmark by the American Society of Civil Engineers. Since being transferred to the Park Service, the Castillo has become a popular tourist attraction. It occupies 2.5 acres (10,100 m²) in downtown St. Augustine, Florida. The fort has been featured on many television shows including Monumental Mysteries and Ghost Adventures, as well as the 1951 film Distant Drums. Castillo De San Marcos from the west, looking east. The side of Castillo de San Marcos in St. Augustine, FL. ^ Marcus Whiffen; Frederick Koeper (January 1983). American Architecture: 1607-1860. MIT Press. p. 40. ISBN 978-0-262-73069-3. ^ Spanish Colonial Fortifications in North America 1565–1822. Osprey Publishing. 2010. p. 6. ISBN 978-1-84603-507-4. ^ Lawrence Sanders Rowland; Alexander Moore; George C. Rogers (1996). The History of Beaufort County, South Carolina: 1514–1861. Univ of South Carolina Press. p. 63. ISBN 978-1-57003-090-1. ^ The Archaeology of Mission Santa Catalina de Guale. University of Georgia Press. 1994. p. 136. ISBN 978-0-8203-1712-0. ^ James D. Kornwolf. Architecture and Town Planning in Colonial North America. Johns Hopkins University Press. p. 1569. ISBN 978-0-8018-5986-1. ^ Albert C. Manucy. The Building of Castello de San Marcos: National Park Service Interpretive Series, History No. 1. United States Government Printing Office Washington. p. 18. GGKEY:R1D08K7CWUJ. ^ Frances H. Kennedy (13 May 2014). The American Revolution: A Historical Guidebook. Oxford University Press. p. 134. ISBN 978-0-19-932423-1. ^ John W. Griffin; Patricia C. Griffin (1996). Fifty Years of Southeastern Archaeology: Selected Works of John W. Griffin. University Press of Florida. p. 167. ISBN 978-0-8130-1420-3. ^ United States. National Park Service. Division of Publications (1993). Castillo de San Marcos: a guide to the Castillo de San Marcos National Monument, Florida. U.S. Dept. of the Interior. p. 22. ISBN 978-0-912627-59-5. ^ National Park Service. "Castillo de San Marcos brochure" (PDF). Retrieved 19 February 2018. ^ Arnade, Charles (1959). The Siege of Saint Augustine 1702. University of Florida Monographs: Social Sciences #3. Gainesville, FL: University of Florida Press. OCLC 1447747. pp. 5, 14. ^ Jay Higginbotham (1991). Old Mobile: Fort Louis de la Louisiane, 1702-1711. University of Alabama Press. pp. 114–116. ISBN 978-0-8173-0528-4. ^ Arnade (1959), p. 37. ^ Arnade (1959), pp. 55–57. ^ Arnade (1962), p. 33. ^ Arnade (1959), pp. 41–43, 47, 56. ^ David J. Weber (17 March 2009). Spanish Frontier in North America. Yale University Press. p. 136. ISBN 978-0-300-15621-8. ^ Thom Hatch (17 July 2012). 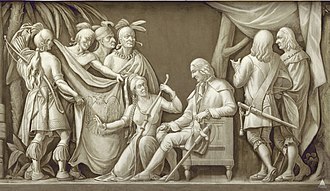 Osceola and the Great Seminole War: A Struggle for Justice and Freedom. St. Martin's Press. pp. 214–215. ISBN 978-1-4668-0454-8. ^ Patricia Riles Wickman (27 August 2006). Osceola's Legacy. University of Alabama Press. p. 142. ISBN 978-0-8173-5332-2. ^ Simon Harrison (15 June 2012). Dark Trophies: Hunting and the Enemy Body in Modern War. Berghahn Books. p. 85. ISBN 978-0-85745-499-7. ^ Charles Bingham Reynolds (1885). Old Saint Augustine: A Story of Three Centuries. E. H. Reynolds. pp. 130–131. ^ Gene M. Burnett (1 July 1997). Florida's Past: People and Events That Shaped the State. Pineapple Press Inc. pp. 112–114. ISBN 978-1-56164-139-0. ^ Hilton Crowe (December 1940). "Indian Prisoner-Students at Fort Marion: The Founding of Carlisle Was Dreamed in St. Augustine". the Regional Review (United States National Park Service). ^ Fear-Segal, Jacqueline (2007). White Man's Club: Schools, Race, and the Struggle of Indian Acculturation. University of Nebraska Press. p. 14. ISBN 0803220243. ^ K.B. Kueteman. "From Warrior to Saint: The life of David Pendelton Oakerhater". Oklahoma State University. Archived from the original on 2008-07-23. Retrieved 2011-01-21. Diane Glancy, Fort Marion Prisoners and the Trauma of Native Education. Lincoln, NE: University of Nebraska Press, 2014. A star fort, bastion fort or trace italienne, is a fortification in a style that evolved during the age of gunpowder when the cannon came to dominate the battlefield. 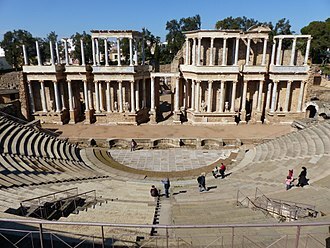 It was first seen in the century in Italy. The design of the fort is normally a pentagon or hexagon with bastions at the corners of the walls and these outcroppings are present for the purpose of a total, panoramic view of the battlefield. Because of the bastions and cannon operators can hit any target on the battlefield without having to lean over the wall, many bastion forts feature cavaliers, which are raised secondary structures based entirely inside the primary structure. The predecessors of star fortifications were medieval fortresses, usually placed on high hills, from there, arrows were shot at the enemies, and the higher the fortress was, the further the arrows flew. The enemies hope was to ram the gate or climb over the wall with ladders. For the invading force, these fortifications proved quite difficult to overcome, passive ring-shaped fortifications of the Medieval era proved vulnerable to damage or destruction by cannon fire, when it could be directed from outside against a perpendicular masonry wall. In addition, a force that could get close to the wall was able to conduct undermining operations in relative safety. In contrast, the fortress was a very flat structure composed of many triangular bastions, specifically designed to cover each other. In order to counteract the cannonballs, defensive walls were lower and thicker. The outer side of the ditch was provided with a glacis to deflect cannonballs aimed at the lower part of the main wall. They were built of materials, usually earth and brick. Star fortifications were developed in the late fifteenth and early sixteenth centuries primarily in response to the French invasion of the Italian peninsula. The French army was equipped with new cannon and bombards that were able to destroy traditional fortifications built in the Middle Ages. Star forts were employed by Michelangelo in the earthworks of Florence. The design spread out of Italy in the 1530s and 1540s and it was employed heavily throughout Europe for the following three centuries. Italian engineers were heavily in demand throughout Europe to help build the new fortifications, the late-seventeenth-century architects Menno van Coehoorn and especially Vauban, Louis XIVs military engineer, are considered to have taken the form to its logical extreme. Ledger art is a term for Plains Indian narrative drawing or painting on paper or cloth. Ledger art flourished primarily from the 1860s to the 1920s, a revival of ledger art began in the 1960s and 1970s. The term comes from the ledger books that were a common source of paper for Plains Indians during the late 19th century. Ledger art evolved from Plains hide painting, among Plains tribes, women traditionally paint abstract, geometrical designs, whereas men paint representational designs. The mens designs were often heraldic devices or visions painted on shields, shirts, before the Plains tribes were forced to live on reservations in the 1870s, men generally painted personal feats in battle or hunting. Plains ledger art depicted communally acknowledged events of valor and tribal importance in order to gain status for the individuals who participated in them, Plains pictorial art emphasizes narrative action and eliminates unnecessary detail or backgrounds. Figures tended to be drawn in hard outlines and filled with fields of color. These were all painted on animal hides – particularly buffalo hides. When buffalo became scarce after eradication programs encouraged by the US federal government, Plains artists began painting and drawing on paper, canvas, an increasing supply of ledger books and other paper came from traders, government agents and military officers. With these came pencils, ink pens, crayons. These new tools allowed for greater detail and experimentation than the earlier tools, the compact ledger books and pencils were highly portable, making them ideal for nomadic lifestyles. The most celebrated artists were prisoners of war at Fort Marion in St. Augustine. In the harsh winter of 1874 to 1875, many camps were forced to surrender to various Indian agencies. From 1875 to 1878, the 71 men and one woman were under the command of Richard Henry Pratt and he provided the prisoners with basic art supplies, such as pencils, crayons, watercolor paint, and paper. Twenty-six of the Fort Marion prisoners engaged in drawing and they were younger Cheyenne and Kiowa men. Chiricahua are a band of Apache Native Americans, based in the Southern Plains and Southwest United States. Culturally related to other Apache peoples, Chiricahua historically shared an area, customs. 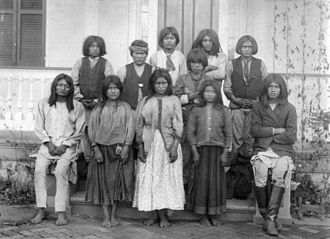 At the time of European contact, they had a territory of 15 million acres in Southwestern New Mexico and Southeastern Arizona in the United States and in Northern Sonora, the San Carlos Apache Tribe, Arizona does have Chiricahua Apache people there also. 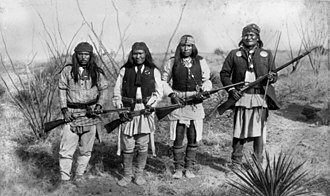 The Chiricahua Apache were initially given their present name by the Spanish, written as Chiricagui, Apaches de Chiricahui, Chilicague and Chiricagua. The White Mountain Apache, including the Cibecue and Bylas groups of the Western Apache, called them Hai’ą́há and the San Carlos Apache called them Háką́yé which means ″Eastern Sunrise, i. e. The Chiricahua autonym for themselves is, depending on the dialect, simply Nde, Ne, Néndé, Héndé or Hen-de - ″The People, Men″ - they never called themselves ″Apaches″. £igá means it is white or it can be translated as it is colored, the í on the end usually translates as the one that is. Please see the Bands section below for more names of bands and sub-bands of the Chihuahua, several loosely affiliated bands of Apache came improperly to be usually known as the Chiricahuas. These included the Chokonen, the Chihenne, the Nednai and Bedonkohe, all are commonly referred to as Chiricahua, but they were not historically a single band nor the same Apache division, being more correctly identified, all together, as Central Apaches. Many other bands and groups of Apachean language-speakers ranged over eastern Arizona, the bands that are grouped under the Chiricahua term today had much history together, they intermarried and lived alongside each other, and they occasionally fought with each other. They formed short-term as well as longer alliances that have caused scholars to classify them as one people, the Apachean groups and the Navajo peoples were part of the Athabaskan migration into the North American continent from Asia, across the Bering Strait from Siberia. 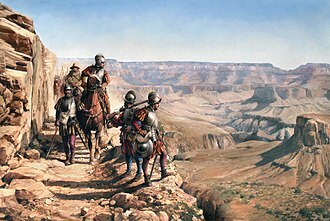 As the people moved south and east into North America, groups splintered off and became differentiated by language, among the last of such splits were those that resulted in the formation of the different Apachean bands whom the Europeans encountered, the southwestern Apache groups and the Navajo. 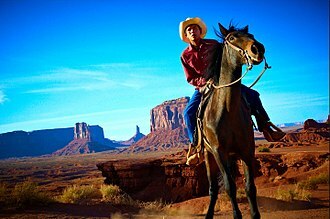 Although both speaking forms of Southern Athabaskan, the Navajo and Apache have become culturally distinct. k. a, from the beginning of EuropeanAmerican/Apache relations, there was conflict between them, as they competed for land and other resources, and had very different cultures. Their encounters were preceded by more than 100 years of Spanish colonial and Mexican incursions, by the Treaty of Guadalupe Hidalgo of 1848, the US took on the responsibility to prevent and punish cross-border incursions by Apache who were raiding in Mexico. The Apache viewed the United States colonists with ambivalence, and in some cases enlisted them as allies in the years against the Mexicans. In 1852, the US and some of the Chiricahua signed a treaty, during the 1850s, American miners and settlers began moving into Chiricahua territory, beginning encroachment that had been renewed in the migration to the Southwest of the previous two decades. This forced the Apachean people to change their lives as nomads, the US Army defeated them and forced them into the confinement of reservation life, on lands ill-suited for subsistence farming, which the US proffered as the model of civilization. Geronimo was a prominent leader and medicine man from the Bedonkohe band of the Chiricahua Apache tribe. While well known, Geronimo was not a chief among the Chiricahua or the Bedonkohe band, at any one time, about 30 to 50 Apaches would be following him. However, since he was a leader in raiding and warfare he frequently led large numbers of men and women beyond his own following. During Geronimos final period of conflict from 1876 to 1886 he surrendered three times and accepted life on the Apache reservations in Arizona, reservation life was confining to the free-moving Apache people, and they resented restrictions on their customary way of life. 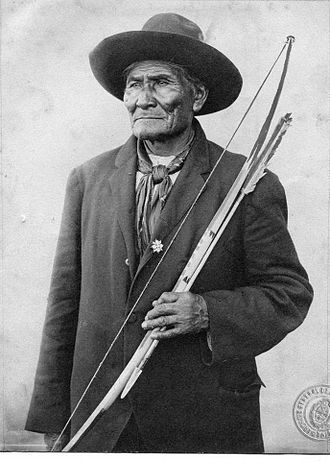 Geronimo was transferred to General Nelson Miles at Skeleton Canyon, in his old age, Geronimo became a celebrity. He appeared at fairs, including the 1904 Worlds Fair in St. Louis, however, he was not allowed to return to the land of his birth. He died at the Fort Sill hospital in 1909 and he was still a prisoner of war. He is buried at the Fort Sill Indian Agency Cemetery surrounded by the graves of relatives, Apache is the collective term for several culturally related groups of Native Americans originally from the Southwest United States. The current division of Apachean groups includes the Western Apache, Mescalero, Lipan, raids ranged from stealing livestock and other plunder, to the capture and/or killing of victims, sometimes by torture. 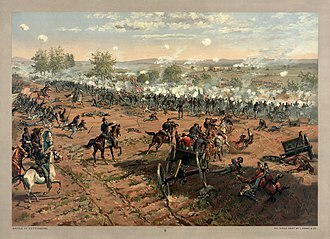 Mexicans and Americans responded with attacks against the Apache which were no less violent. The raiding and retaliation fed the fires of a virulent revenge warfare that reverberated back and his fighting ability extending over 30 years forms a major characteristic of his persona. Among Geronimos own Chiricahua tribe many had mixed feelings about him, while respected as a skilled and effective leader of raids or warfare, he emerges as not very likable, and he was not widely popular among the other Apache. Nevertheless, Apache people stood in awe of Geronimos powers which he demonstrated to them on a series of occasions and these powers indicated to other Apaches that Geronimo had super-natural gifts that he could use for good or ill. 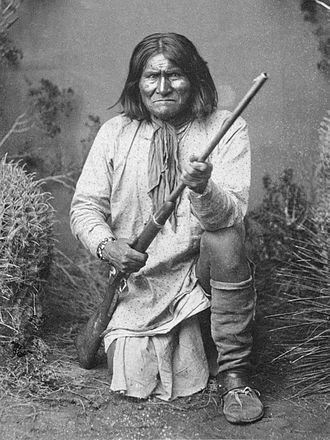 In eye-witness accounts by other Apaches, Geronimo was able to become aware of distant events as they happened and he demonstrated powers to heal other Apaches. Francis Marion was a military officer who served in the American Revolutionary War. Due to his methods of warfare, he is considered one of the fathers of modern guerrilla warfare and maneuver warfare. He was known as The Swamp Fox, Francis Marion was born on his familys plantation in Berkeley County, South Carolina, c. Around the age of 15, he was hired on a bound for the West Indies which sank on his first voyage. During the following years, Marion managed the familys plantation, Marion began his military career shortly before his 25th birthday. On January 1,1757, Francis and his brother, were recruited by Captain John Postell to serve in the French and Indian War and to drive the Cherokee Indians away from the border. On June 21,1775, Marion was commissioned captain in the 2nd South Carolina Regiment under William Moultrie, with whom he served in June 1776 in the defense of Fort Sullivan, in September 1776, the Continental Congress commissioned Marion as a lieutenant colonel. In the autumn of 1779, he took part in the siege of Savannah, a British expedition under Henry Clinton moved into South Carolina in the early spring of 1780 and laid siege to Charleston. Marion was not captured with the rest of the garrison when Charleston fell on May 12,1780, Clinton took part of the British army that had captured Charleston back to New York but a significant number stayed for operations under Lord Cornwallis in the Carolinas. At this point, Marion was still crippled from the slowly healing ankle. Marion joined Major General Horatio Gates just before the Battle of Camden but Gates had no confidence in him, Gates asked him to undertake scouting missions and to impede the expected flight of the British after the battle. 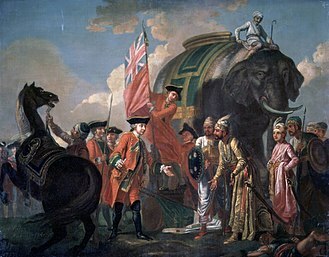 Marion thus missed the battle, which proved to be a decisive British victory, Marion showed himself to be a singularly able leader of irregular militiamen and ruthless in his terrorising of Loyalists. Unlike the Continental troops, Marions Men, as they were known, served without pay, supplied their own horses and often their food. Marion rarely committed his men to frontal warfare, but repeatedly surprised larger bodies of Loyalists or British regulars with quick surprise attacks and equally quick withdrawal from the field. The Sand Creek massacre as drawn by eyewitness Howling Wolf (1874–1875). Drawing by Black Hawk (Sans Arc Lakota), c. 1880 depicting a horned Thunder Being (Haokah) on a horse-like creature with eagle talons and buffalo horns. The creature's tail forms a rainbow that represents the entrance to the Spirit World, and the dots represent hail. Accompanying the picture on the page were the words: "Dream or vision of himself changed to a destroyer and riding a buffalo eagle."